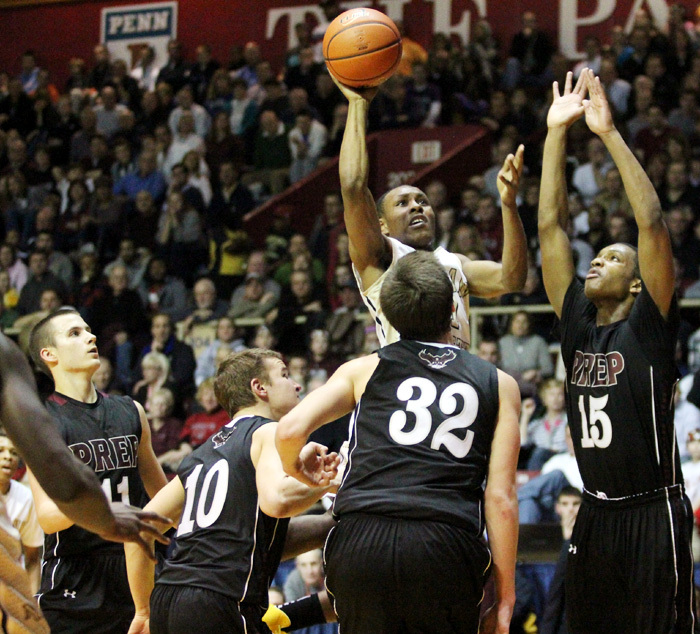 Neumann-Goretti's Hanif Sutton goes up for a shot surround by Prep's Kyle Thompson, Dan Nedbal, Stephen Vasturia and Dan Sherry. Junior Ja’Quan Newton scored 27 points to lead Neumann-Goretti to a 60-42 Catholic League championship victory over St. Joseph’s Preparatory School Monday night at the Palestra. The Saints, who also received 11 points and 11 rebounds from senior man-child John Davis, have now captured five straight league titles. The record for consecutive championships is six, a feat pulled off by Roman Catholic from 1989 through 1994. For the Prep, senior Steve Vasturia scored 14 points and grabbed eight rebounds while sophomore Chris Clover netted 11 points in 5-of-6 shooting.